If you ever looking to see a mix of reactions in a group of people, tell them that you are a math major. I’m not even kidding, this is actually quite hilarious! I am a double major in math and psychology at Erskine and, because everyone in American culture routinely asks college students what they are majoring in, I often have to tell people about my majors. Their reactions usually follow one of two extremes: the look of awe, as if I have personally halfway completed the quest to cure cancer, or the look of extreme disgust as they wonder what kind of torture I must have endured as a child to voluntarily subject myself to such a fate. Meeting a new group of people is almost as always interesting as the various new acquaintances either nod at my announcement or, alternatively, may go to great lengths to express their dissatisfaction with my decision. Some even go to such extremes as to pretend to stick their fingers down their throats and make gagging noises….. quite an extreme reaction, in my opinion! 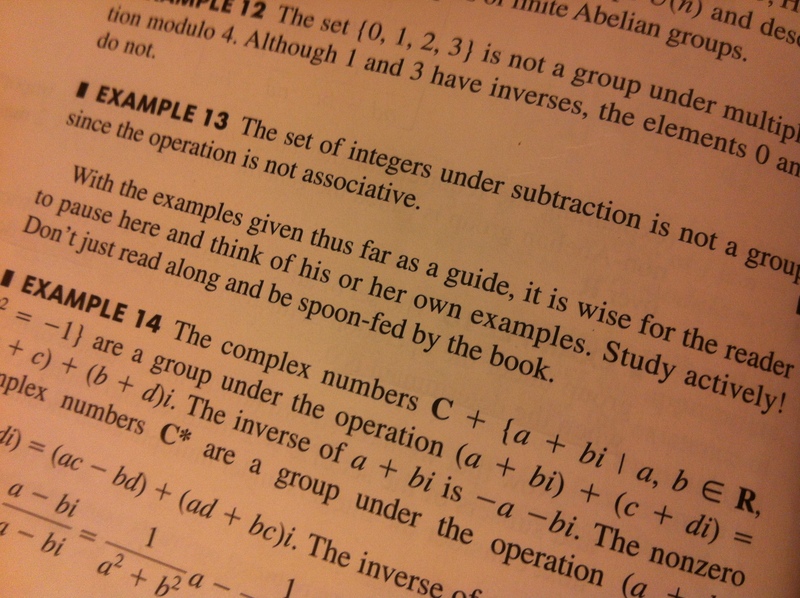 As a math major, I have spent a lot of time learning how to prove various statements. (This is also somewhat funny because in psychology, my other discipline, to say that you have proved something is akin to saying you wish to torture small animals or something equally ghastly.) Proving a statement in math is quite difficult for me and often takes a lot of work, but I am usually quite proud of any proof I have written! I have a friend at the University of St. Andrews in Scotland called Scott who also studies math and is absolutely brilliant at writing proofs. I am pretty sure that any proof I could write now, he wrote when he was about twelve or thirteen. Nonetheless, studying math and proof writing is really awesome because it is cross cultural — anybody, no matter what language they speak, should be able to read and understand a well written proof in math. Even as a study abroad student in Scotland last semester, the language of proofs was still the same! 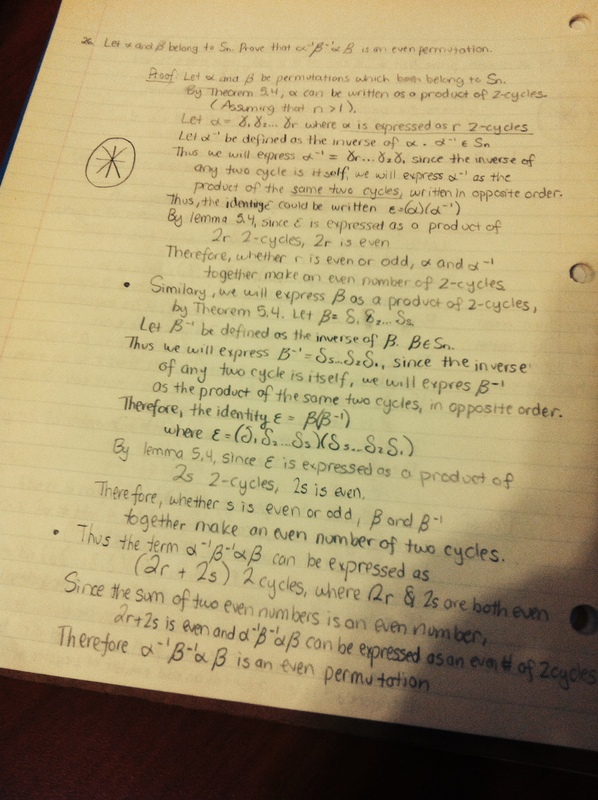 For instance, here is a proof I attempted to write last night for abstract algebra! One thing I have learned in life is that not everything can be as neat and tidy as a math proof. Friendships and relationships can be difficult, and not every question so easily answered. Sometimes situations can arise where no one is sure about the right answer, and tough decisions have to be made. I think that one of the things that makes Erskine special is that, not only do we learn about life inside of the classroom, we have a lot of opportunity to learn about life outside of the classroom. As I have studied how to prove that the square root of two is irrational, I have also studied questions about my closest friendships. 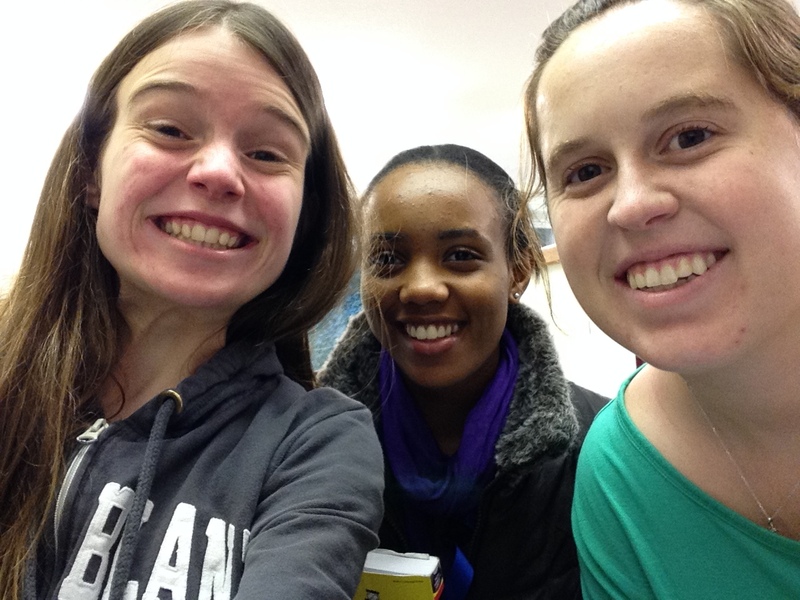 At Erskine I have had the opportunity to explore: what is the proof of a good friend? Proverbs 17:17 tells us that “A friend loves at all times, and a brother is born for a time of adversity.” One of my biggest blessings at Erskine for me has been the opportunity to make close friends, both at home and abroad. The word love is also defined for us, in 1 Corinthians, and probably quite familiar to you. I think of my darling Elisabeth, who is always so patient with me and sweet Samantha who has never said an unkind word to anyone. Friends who are humble, like Rachel who enjoys whatever the Lord has blessed her with and does not envy the possessions of others. Or Ben, who has so much to be proud of, but does not boast in his own accomplishments, and Kate who is not proud even though culture might say she has every right to be. Some of my good friends: Kendra, Kate, & Tiffany! 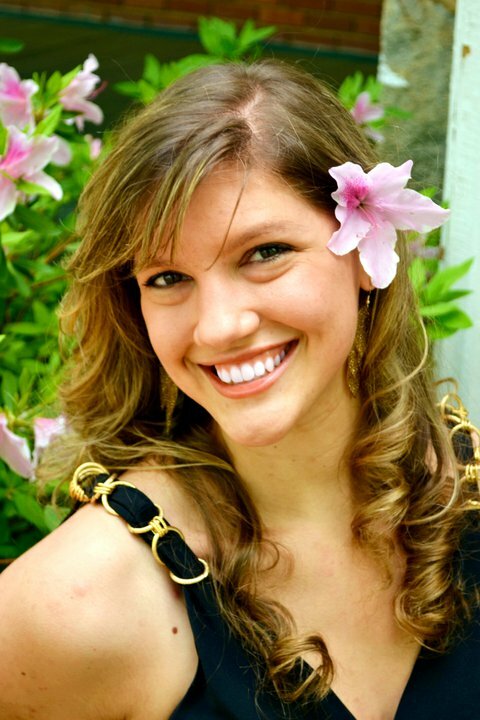 My friend Vannah, though she has been through many trials, does not dishonor anyone- at least, not that I have ever heard! Girls like Tiffany who are not self-seeking, but constantly look to support and help others. Or how about my roommate, Victoria, who lived with me for two years but was never easily angered by my crazy living habits?? I have, also, to think of Kendra, one of the most forgiving girls I know, who constantly looks for the best in people and keeps no record of wrongs against her. And how would I survive without Heather, who does not delight in any sin in my life, but rejoices in learning God’s truth with me. Last night my dear friend Christine went out of her way to protect me- to bring me dinner when she knew I had none. 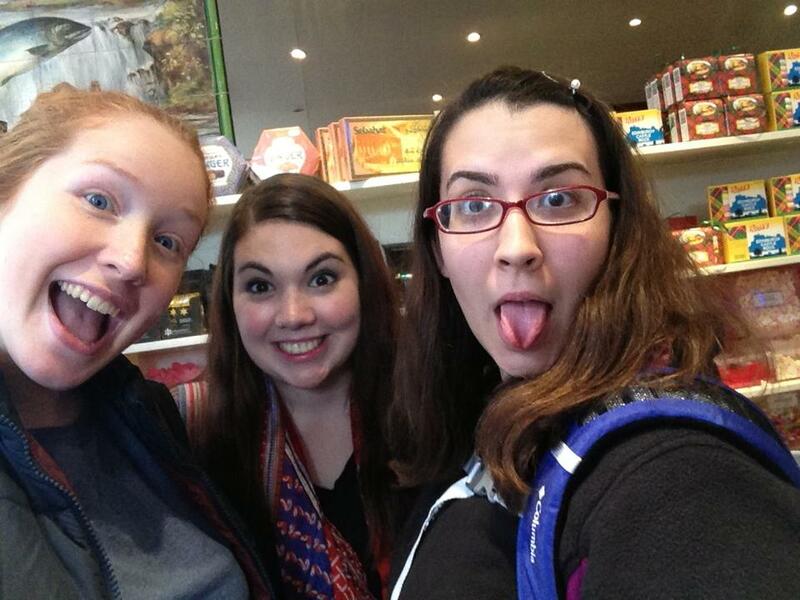 My beautiful Sarah always trusts that I will be a good friend to her, my friend Amanda who has always had such high hopes for all of her friends, and Lolly has persevered as one of my closest friends since the very first day of orientation! As a student at Erskine, I have learned many lessons in math and psychology, about how to prove a mathematical statement and how to demonstrate ideas about human nature with psychology. My favorite learning experiences, however, have focused on friendships. In the past four years I have learned much about how to be a good friend and know a good friend when you see one: and these (hopefully) are not announcements that make any one want to gag! Merry Christmas everyone! Today is born our Savior! I pray that the holiday season finds you and your family healthy, happy, and enjoying the many blessings God has bestowed upon you. I know that, personally, I am so grateful for surviving the last month of school, including a rather stressful exam week. In honor of the Christmas season, I wanted to resume my blog posts by writing about some of the greatest blessings that God has given me through Erskine. I do apologise in advance: I have no photos to do this post justice, so my ramblings will have to suffice. I will make up for it in future posts. So…(in no particular order) here we go! I am grateful that, as a Christian college, Erskine brings us all together through our shared faith in so many ways: college chapel services; prayer before classes, meetings, and performances; various organizations and clubs; small-groups and Bible studies; impromptu gatherings in the residence halls; and so many others. I am grateful for being able to live in Carnegie Hall for 3 of my 4 years at Erskine. As a freshman, Ms Ruth and my SLAs were always supportive and helpful no matter the emergency (of both the small and large varieties). I met so many great girls my first year that I still study, laugh, and cry with. As an upperclassmen, I’ve had the ability to serve as a Student Life Assistant for 3 years (this is my second in Carnegie). I have an even greater appreciation for my awesome freshman year now that I understand more fully what goes on behind the scenes, and I love being able to watch out for and get to know my girls. And, lets’ be honest: Carnegie is probably the prettiest building on Erskine’s campus. Who wouldn’t love living in a beautiful hundred-year-old hall? I am grateful for Ms Ruth, the RD in Carnegie for the past 20 years. This woman wears a whole lot of hats, most of which she wears quietly. She has the best stories, knows absolutely everything about Erskine, and has lived a terribly exciting life. I have learned so much from her and she truly has the best advice. As an added bonus, Ms Ruth makes sure that the halls of Carnegie are truly decked with boughs of holly, lights, trees, and bows. I am grateful for every professor I have had the opportunity to learn from. They challenge me academically and personally–often intertwining–and have truly helped me become a better, stronger, more well-rounded individual. I am confident that they have prepared me fully for graduate school and beyond. I know my professors not just as teachers, but as individuals. I know their backgrounds, their families, and their hobbies. I cannot think of another college where you would form this type of relationship with one professor, let alone most or all of them. Erskine often talks about “thriving,” and my professors are the reason I thrive here. I am grateful that Erskine gave me the opportunity to study abroad at the University of St Andrews. All of my scholarships transferred, making it very affordable for me to spend this past spring there. I was more than ready to get there and heartbroken to return home. St Andrews was so much fun and a priceless experience that I will never forget. It is hard to be so far away from all of the friends I made there; but on the plus side, I have friends to visit all over the world now! I am grateful for the psychology department. At many colleges and universities, psychology can be the “easy” major. Not here. I have definitely worked hard for my As and I am amazed sometimes at both the number of pages I have read over the past 3.5 years and how much I have learned. I know that learning is the point of college, but we as students (and by “we,” I definitely refer at least to myself) tend to get caught up in grades and GPA. Dr Elsner, for example, always laughs when we come to his office stressing about grades. As he and the other professors have gradually gotten us to accept, it’s most important to focus on the work and the learning; the grades are secondary. As a psychology major, I have gotten to write countless papers, learn statistics software, conduct and present original research, collaborate with other students, participate in a summer research internship, be accepted to intern at a mental hospital this spring, and become the psychology lab manager. Graduate school? Bring it on. I am grateful for the music department. Despite not majoring or minoring in music, I have a music scholarship and get to take voice lessons and sing with the Choraleers. I’ve also been a member of the Chamber Choir and Bella Voce and performed in opera workshops and various other performances over the past several years. It is definitely a blessing to practice and perform with such talented individuals, and the faculty … talented doesn’t even begin to describe it. Some of my favorite college memories relate to Choraleers retreats and tours. I have grown as a musician and as a Christian and I know my experiences with the department will serve me well in future ministry and life in general. Continuing with the arts, I am grateful to be an active member of Erskine’s theatre department. Actually, we technically aren’t even a department, but that certainly does not stop us from acting up a storm! As a member of Alpha Psi Omega, I get to help make the magic happen both on the stage and behind the scenes. I had to take a break from the improv this group this past semester, but I hope to finish out my time at Erskine as an active member again this spring. My fellow Thespians are, quite frankly, talented. And did I mention funny? They are definitely both. In sum, if you have never seen any music or theatre performances at Erskine, you are missing out. We’d love to see you in the audience! I am grateful for my friends. Late night studying, paper writing, rehearsing, procrastinating, finding amusement in Due West, 2AM excursions to IHOP, cooking together, and so much laughter … I wouldn’t trade it for anything! I could probably easily spend another thousand words writing about how great Erskine is and how God has blessed me in my time there, but my mom is about to take the baked ziti out of the oven and I am too excited to eat a big chunk of it. I hope your stomach is as happy as mine is about to be. I pray that your heart may be content and that this season will bring you happiness and peace. Joy to the world, the Lord is come! As an American sojourning in a foreign land, I felt that it was my personal responsibility to introduce my fellow students to the happiness and joy that a genuine spirit of thankfulness can bring to a person (especially when that spirit of thankfulness is expressed in a large turkey!) In other words, I really wanted to cook a whole bunch of food for my friends over here, and let them know what a real American Thanksgiving is like! It makes sense that they don’t celebrate Thanksgiving over here. After, Thanksgiving is a celebration of a first harvest in the new world, and Scotland is certainly part of the old world. It’s a little more surprising that none of them seem to know what Thanksgiving is about, and many seem to guess that is has something to do with Lincoln. (A fact that I find quite interesting, Lincoln was the first to declare Thanksgiving a national holidays, but US citizens are more likely to think of pilgrims.) What really got me, though, was my friend Rachel declaring that she had never even heard of Thanksgiving! I wondered to myself, what do they DO in Northern Ireland?? Every Thursday evening here in St. Andrews, I take part in a wonderful small group with some of the best people I have met here in Scotland. The group is diverse; we have two Americans, one person from Singapore, three Northern Irish, as well as a healthy blend of Scottish and English students! 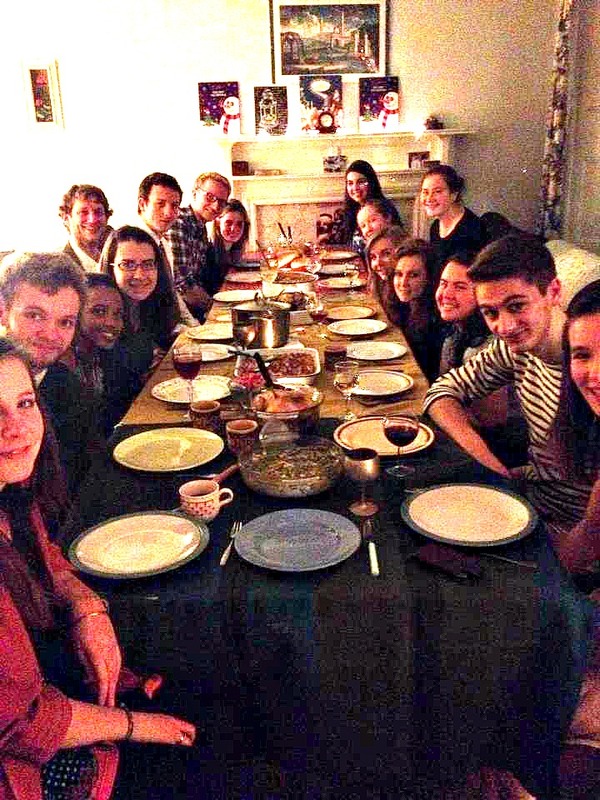 🙂 And of course, because small group occurs every Thursday, the two Americans (Vannah and I) realized fairly early on in the term that we needed to introduce our small group to a proper Thanksgiving! The most hilarious thing was watching all of the British students see all of our food for the first time. None of them had ever had green bean casserole, sweet potato casserole, or even heard of dressing (stuffing!) They wondered at sweet tea and asked if they were supposed to add milk, or if it was alcoholic. They stared at their plates and made comments about how they had never had so many strange foods on their plate at the same time! It was basically hilarious! J One of the best parts of the evening occurred at the end, when everyone around the table shared what they were most thankful for! It is always amazing to take time to give thanks to the Lord for all of His amazing blessings, and I certainly know I have MANY things to be grateful for! If you have ever met me before, you may know that I love to describe everything as “the best thing in the entire world!” or perhaps, for some variation, as “the best thing that has ever happened to me!” Most people roll their eyes at my obvious enthusiasm and tell me that I am exaggerating and that whatever has recently happened to me is actually not the best thing that ever happened. This then starts the frequently repeated discussion where I explain that it really is the best thing that ever happened, because it was happening at the same time as I remembered all of the other wonderful things that ever happened to me. And if something wonderful happens tomorrow it will be even better because tomorrow I will also have the memories of today and every other day!! Most people think I am crazy. On that note, this weekend was possibly the best weekend of my entire life! For one thing, I did not even have to solve even ONE math problem or attend ANY extremely long lectures. Instead I got to spend the weekend learning about the Word of the Lord and fellowshipping with Christian friends (and drinking lots of tea!) At this point you are probably wondering to yourself, how did Holly manage to have such an awesome weekend?? What a great question! Cornerstone St. Andrews (the church I have been attending here in Scotland) decided they would arrange a weekend away for the Uni students and I decided I would go along. At first that may seem like an easy enough decision to you: to leave on a Friday afternoon and go for a weekend away in Comrie with your fellow Christian students. Sounds easy, but I was really scared. 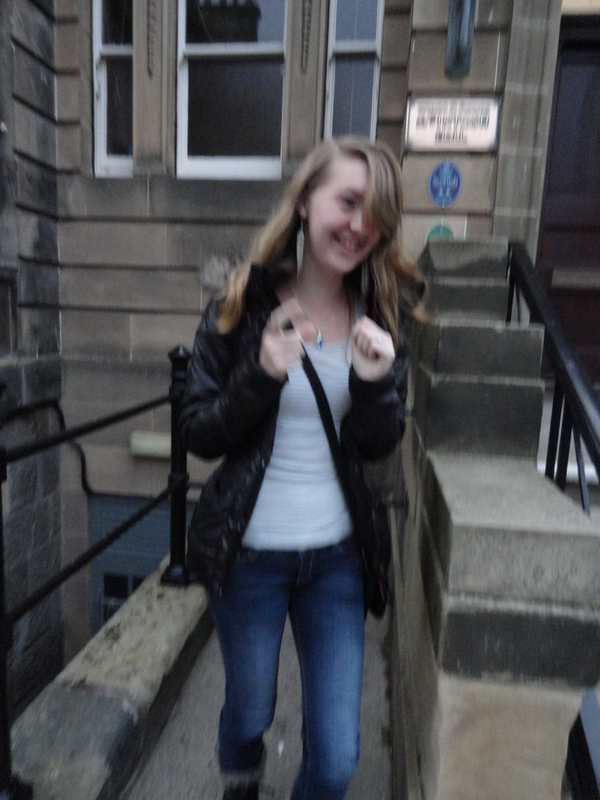 After all, I have only been in Scotland for one month (today is my one month anniversary in Scotland!) and have only known these girls for a couple of weeks. What if they did not like me? What if I had an awful time? What if they all thought my American accent was weird and decided not to talk to me for the entire weekend! I was quite scared about how the weekend would go. Despite my somewhat ridiculous fears, the weekend turned out wonderfully! We left on Friday afternoon and drove for about two hours to a small house in a small town called Comrie. Let me tell you, Comrie has got to be one of the most beautiful places ever! It is surrounded by rolling hills, forests, and rivers with riverbeds of small stones. It was one of the most beautiful places in the entire world! One of my favourite parts of the weekend was going out to the river each morning to spend a half hour praying and reading the Word. Honestly, I am not quite sure who WOULDN’T want to live here!! The theme of our weekend was ‘Facing Reality.’ We talked about how in our Christian lives surrounding our whole selves to God is more than an afternoon walk in the park and much more than occasional afternoon or evening entertainment. In our small groups we talked about how surrendering your life to God is something that is more about asking the Lord to change your heart and your thoughts than just trying to be a “better Christian” by just doing more “religious stuff.” It is about changing your entire outlook on life and living your entire life for God. We also had an amazing speaker (called Laurence) from the Netherlands who came with us for the weekend and shared his testimony about how he surrendered his life to the Lord at the age of 17 and the ways that the Lord has grown him in maturity and understanding since that time. A favourite memory from the weekend occurred on Saturday afternoon. After lunch on Saturday we were given a free afternoon until dinner. I was sitting there thinking to myself, what am I going to do with myself all afternoon? Everybody here looks like they all are going to have fun things to do, but what if none of them wants to do anything with me?? But before I could worry anymore about how I would entertain myself, the girls from my Bible study group invited me to come the nearby town of Crief with them! And we had the most FANTASTIC time! We went to a coffee shop to have some tea/coffee and then we went to the park. 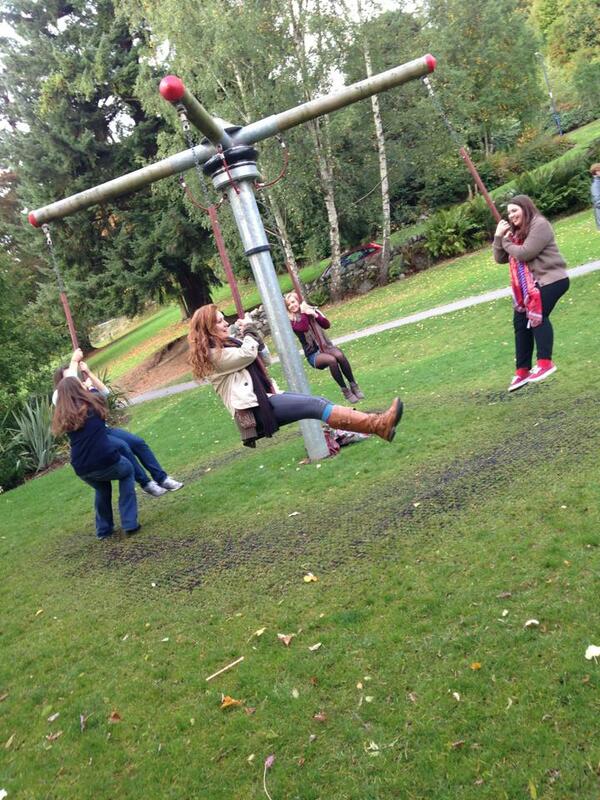 Let me tell you, Scotland playgrounds have the funnest toys EVER! At first I was not sure if they would all think I was crazy if I threw my backpack on the ground and ran over to the swings and bouncy things, but then I decided that the opportunity was too good to miss! 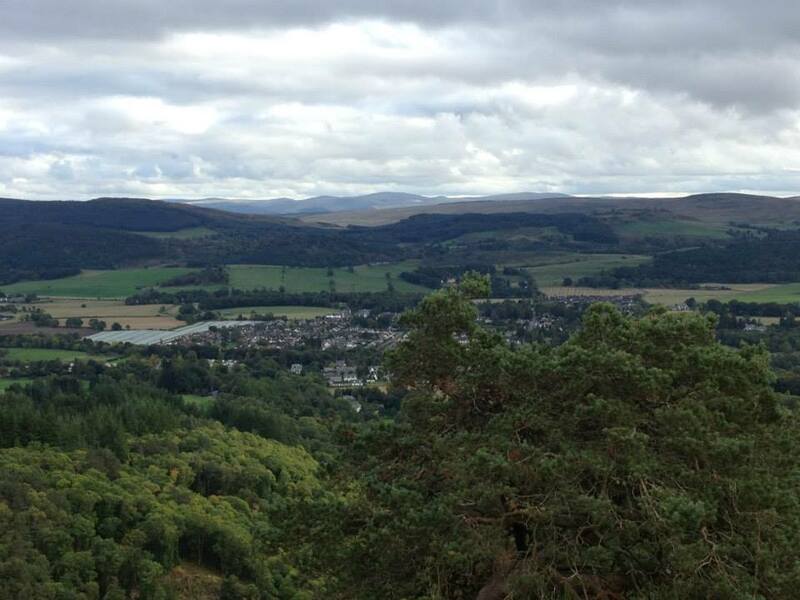 After this wonderful weekend in Comrie, I am starting to realize that I really love being in Scotland. I love the scenery, and the weather, and the people I have met. I LOVE the girls in my small group and the time we spend studying the Word together every Thursday evening. I am really starting to feel like I am part of a community here in Scotland! The 8 girls who went to Crief: 4 mums and their 4 academic daughters! In my opinion, no college or university is complete without its share of strange and sometimes incomprehensible list of bizarre traditions. Clemson students rub their ancient rock before football games, students attending the University of St. Andrews walk up and down the pier on Sundays wearing red robes, and Erskine College girls hold candlelights. Arriving at Erskine my freshman year, I had never heard of a candlelight. I was walking around campus in my innocent freshman-in-her-first-week-of-college state where I constantly imagined that there could not possibly exist anyone as mature or independent as I currently was. And then, bam! I am assaulted on the front steps of my own college with three posters! Come to the candlelight! And I thinking, come to whaaaaatt?? I figured that they must be very popular at Erskine (whatever they were) because three of them were being held that week, with one being that very night! I decided to go along and figure out what it was all about. But once I had stuck around for the rest of the event, I got the basic idea of what was going on, and over the past three years at Erskine my love for the tradition has only grown stronger. The Candlelight is simple: whenever an Erskine girl gets engaged, she attempts to keep it a secret and only tell one or two of her closest friends (I say ‘attempts’ because we need to be real here: girls, especially the recently engaged sort, have a very hard time NOT talking!) That day or evening her friends plan a candlelight for her to help her announce her engagement to the world; they put up posters all around campus announcing that an Erskine girl has been engaged recently and will be having a candlelight some time that week. They usually include a picture or a quote or something which gives you a clue about who the girl might be: but ideally only the one or two girls planning the candlelight know who is engaged. Girls love to talk about candlelights! It makes a very fun game: sitting in your room with your friends talking about who could possibly be engaged. People will guess random couples and discuss how likely they think it is to be each certain person. “Oh no, it could not be her because I am pretty sure she was studying all weekend” or “It could be her! Didn’t she say this weekend was her two year anniversary?? ?” Girls will keep on guessing right up until the candlelight starts, when everyone will gather outside of the women’s dorms in a huge circle. One of the girls who planned the candlelight will light a candle and begin singing. We sing a song about love (the same one every time) while passing the candle from person to person in the circle. And we stare at each other. We wonder who is going to blow out the candle. And now this story comes with a twist. 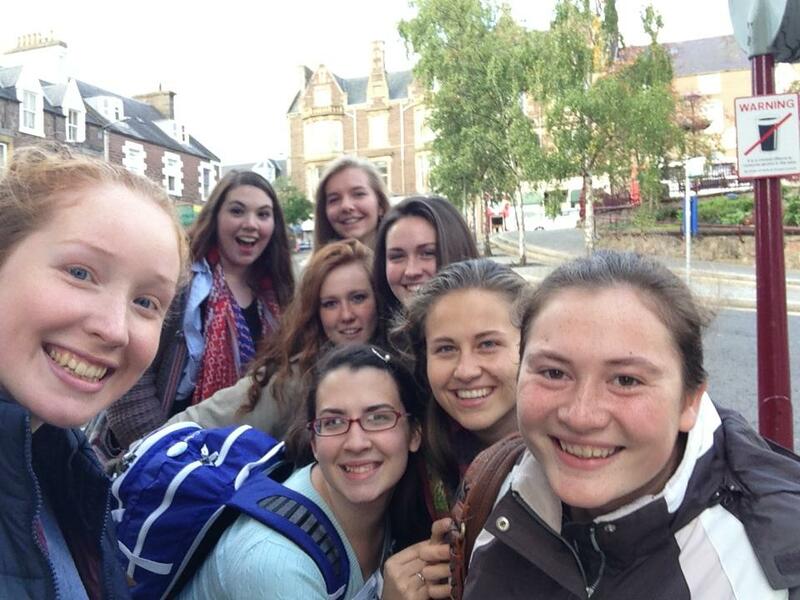 As you know, there are six students (5 girls, 1 boy) from Erskine studying abroad at St. Andrews this semester. Two weeks after we get here the sole male traveller, Robert, decides that he is ready to propose to his girlfriend, who is also studying abroad. 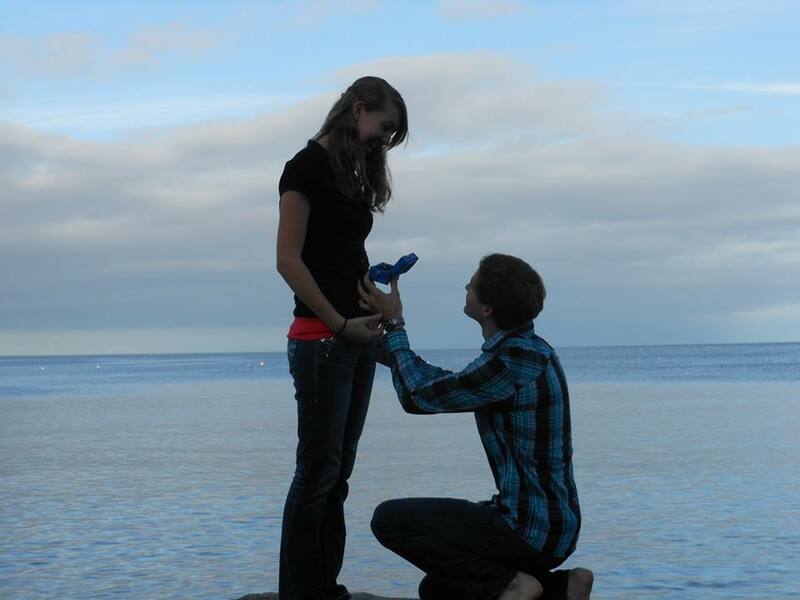 He and his girlfriend, Angel, went to the beach with two other girls from Erskine to do a “photo shoot” when he suddenly bends down on one knee and proposes! We are all very excited for Angel, and the four of us other girls who are here decide that Angel ought to be able to have her very own candlelight! But how can we do it? There are only five Erskine girls here total… and there is no way Angel can wait until we get back from Scotland to tell! So Angel decided she will not be able to have a candlelight after all… but the four of us had other plans! Out plan was fairly simple but surprisingly fun. We told Angel that we all wanted to meet for some ice cream. We convinced her to come outside her dorm and come with us, even if she had not eaten her dinner yet (everyone knows it is the new thing to eat dessert before dinner, Angel!) We all secretly brought a cup of water with us and met her outside on the steps. And just when she had begun to suspect that something was up… surprise!! We dumped water all over and began to sing the song!! We all had a really fun time bringing a little bit of Erskine tradition to St. Andrews to celebrate our friend’s engagement! It was super hilarious because while we were all standing in a circle singing several people walked by and looked at us like…. What on EARTH is WRONG with these people??? But we just kept on singing! About to FLY to SCOTLAND!! Today is going to be one crazy day!! In fact, it has been a rather crazy week. For the first time in my life I am planning to fly (which I have never done before) and also to leave the country (which I have never done before). I will go ahead and stun you with the fact that I am actually planning to fly out of the country, which is a rather overwhelming combination of these two new things. After the party was over I stayed at my friends’ apartment. 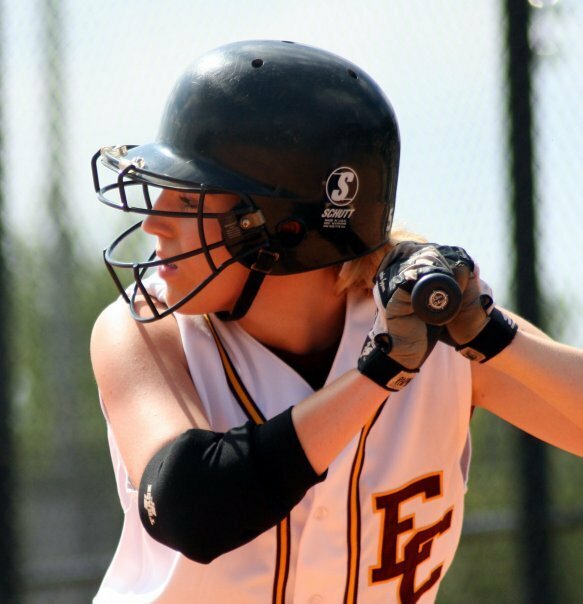 Heather and Sam graduated from Erskine last year and now share an apartment in Greenville. They were the ones who hosted the party and then let me stay with them for two nights and played with me all weekend. Heather and I spent almost the entire day on Sunday worshipping the Lord, by going to church and having our own Bible study. On Monday morning she then drove me to Erskine. 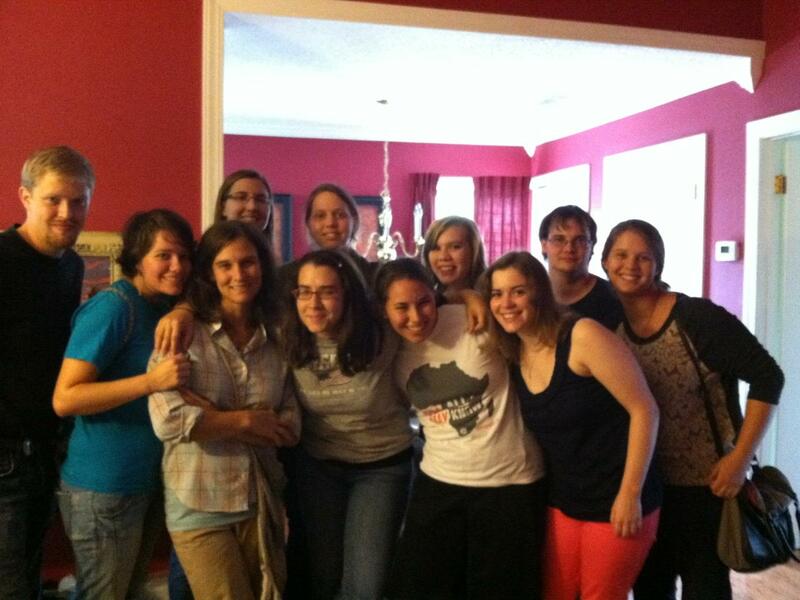 It was lovely to see all of my friends one last time before I cross the pond! Monday at Erskine was crazy. It was the first day of school and all of the students were running around trying to find their new classes and greet each other after a long summer of separation. It was super weird to be there but know that I would only be there for a few hours; I was not there to sign up for classes with everyone else. I was there instead to try to get several forms filled out for graduation and my work-study job, a process which took about 6 hours of running around campus and required about 13 signatures from various people. I had a huge long checklist that I carried with me and it was super fun to check everything off and feel accomplished. On Monday afternoon Tiffany and I gathered up my suitcases and left for her family’s lake house in Columbia, SC. We arrived and have spent the week with her family, with her parents and also her extended family. Tiffany and I have also spent a lot of time preparing for Scotland. We have filled out paper work and more paper work, ordered bedding to arrive when we get there, and arranged everything we can think of for our trip. Tiffany’s family has been super nice to me all week and I have really enjoyed spending time with them! Now it is Friday morning. In about 3 hours I will be at the airport, and in about 5 I will have boarded my plane and be ready for takeoff. I am excited, I am scared, I am nervous. I can’t wait; my heart is beating a thousand beats per minute. Adventure lies ahead! Students at Erskine are often willing to go great distances to help each other out. I can give you an example for this one: last year on my 21st birthday a bunch of friends and I drove a few hours to Columbia, SC to run in the USMC Mud Run. It was super fun! After about two and a half hours of running, though, we were COVERED in mud! I mean, we were swimming in pits of mud deeper than we are tall, so if we came out looking ready for a tea party people might have been a little creeped out! 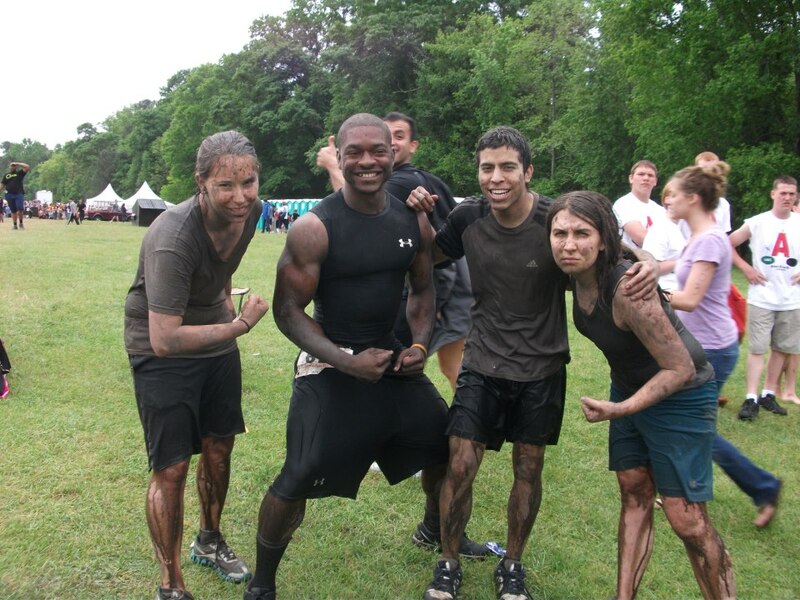 I mean it… look at the mud all over us… we were SUPER GROSS! Another one of my favorite memories of Erskine occurred my sophomore year, about a quarter of the way through the year. My boyfriend of about six months had just broken up with me, and as a typical college student I was lying around inconsolable because I thought my life was over… (I am known for being extremely dramatic during times of distress, but don’t feel bad for me, this is just a natural part of life that everyone must get through!) My sweet friend Leighton called me the next day to cheer me up, and invited me to come to the Erskine volleyball game with her. So Heather, Leighton, and I went to this game when I got a random text message. It from a girl named Kristy, who had been my Orientation Staff leader during my freshmen year at Erskine. The previous year she had a great idea that she was going to surprise some of her friends, including me, by knitting them scarves (it might have been all of her freshmen during O-Staff that she was knitting for… I am not sure!) As great ideas typically go with college students, she had not been able to finish it during the busy school year and so most of us never heard about it that year. The point that I am trying to make here is that I did not know either one of these sweet girls very well. Both of them were seniors during my freshmen year, and even though Megan was my SLA and Kristy was my Orientation leader, I did not get much of a chance to spend any time with either one of them. Yet both of them, during the most important of times, did something amazingly sweet and kind for me that I will remember for the rest of my life. These are the kinds of people you meet at Erskine.